B.B. King had Lucille, Willie Nelson has Trigger, Eric Clapton had Blackie, Neil Young has Old Black and Tim Easton has Paco. He’s sorta dedicated his new album to his favorite guitar. Tim Easton grew up in Akron, Ohio, a town that launched the musical ambitions of Chrissie Hynde, Devo and the Black Keys. The youngest of seven kids, he began playing guitar at age 14, his early inspirations included the Beatles, John Prine, Kiss and Doc Watson. Once he graduated college, Tim hit the road. He wound up in Europe and spent several years busking in places like Prague, Dublin, London and Paris. When he returned to the U.S. he joined The Haynes Boys and in 1996 they released their self-titled debut. Not long after, Tim embarked on a solo career. His debut, Special 20, arrived in 1998, released through Heathen records. Even after Tim signed with New West Records, he continued to ramble, landing in New York and Los Angeles before settling in Joshua Tree. Along the way he wrote and recorded a handful of well-received Folk-Rock albums. The Truth About Us appeared in 2001 and he followed up two years later with Break Your Mother’s Heart, then three years after that with Ammunition. Tim found a home in the artistic enclave of Joshua Tree. At Pappy & Harriet’s he performed as an opening act, a headliner and as part of ad hoc super groups like The Thrift Store All-Stars (which also included Victoria Williams and Teddy Quinn), and The Sunday Band. He continued to record music at a furious clip, 2008 saw the release of Live At Water Canyon, a year later, he was back in the studio making his final New West album, Porcupine. In 2011 he self-released two projects, Since 1966, Vol. 1 and Beat The Band, which featured backing from The Freelan Barons. A few months later, Tim packed up his young family and moved to Nashville, Tennessee. Influenced by the vibrant live music scene, he hooked up with local pickers and players and created his rollicking 2013 album, Not Cool. Somehow, he also found time to collaborate with Leeroy Stagger and Evan Phillips, writing and recording One For The Ditch in 2009 and Resolution Road in 2014, under the Slightly corporate moniker Easton Stagger Phillips. Two years later he released American Fork. Now he’s back with his ninth solo effort, Paco & the Melodic Polaroids. Wanderlust is the prevailing through-line on the album. “California Bars” is a finger-picked lament that is equal parts desolate and defiant. The lyrics chart the course of a kid leaving home; “I left my home in ’92. I saw my mother crying in the rearview mirror,” Before he becomes an unrepentant killer locked behind California bars. On two tracks, Tim pays tribute to a couple of seminal influences. He toasts the father of Country music, Jimmie Rodgers (a.k.a. the Singing Brakeman), by including a faithful version of “Jimmie’s Texas Blues.” A lovesick low-moan that features spidery guitar and some impressive yodeling. Smoky harmonica and a propulsive beat anchor “Elmore James.” Although his mien is playful, Tim takes deadly aim at the disposable music that currently clutters the airwaves; “A lotta racket being made in the world today, these drum machines all sound the same, I think I hear a song, mostly fun and games/You can call me old fashioned or behind the times, but the one who got the moneymaker shakin’ all night was Elmore James.” He backs up his claim by approximating the Blues progenitor’s signature slide guitar tone. Other stand-out cuts here include the feral heartbreak of “Broken Hearted Man.” The record closes with “Baby Come Home,” a minor key waltz accented by high lonesome harmonica that lattices over Tim’s hardscrabble vocals and wistful guitar. Good for the goose lyrics finds this gander being quietly cuckolded by his long-suffering mate. The comeuppance is warranted, but the listener can’t help but respond to the ache in Tim’s voice. 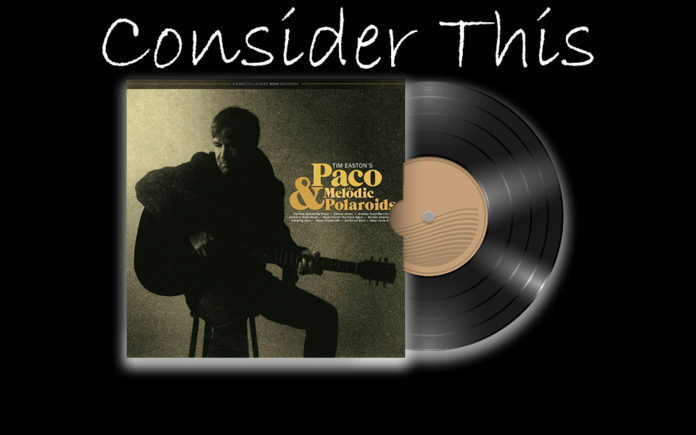 “Paco…” is a stripped-down affair, basically featuring Tim’s voice, some harmonica, a few carefully timed foot-stomps, and of course Paco, his trusty black Gibson J-45. Recorded with just a microphone and portable lathe, the DIY approach gives the album the immediacy of a live performance. Certainly, Tim and Paco will experience more musical adventures, but this record captures a moment in time, never to be replicated.